Edmund Jennings Randolph served as U.S. attorney general and Secretary of State during the administration of President George Washington. Randolph previously had played a central role in the drafting of the U.S. Constitution. Randolph was born on August 10, 1753, in Williamsburg, Virginia. He attended William and Mary College and then studied law with his father, who was a prominent lawyer and the king's attorney in the colony of Virginia. As the American Revolution approached, Randolph sided with the independence movement, while his father remained loyal to the crown. In 1775 Randolph's father, mother, and sisters left for England. In 1775 Randolph briefly served in the Virginia militia as an aide to George Washington before returning to manage his uncle's estate. Randolph's friendship with Washington continued, and soon Randolph was handling Washington's personal legal affairs. Randolph's political career began in 1776 when he served in the Virginia Constitutional Convention. He helped draft a Bill of Rights and a state constitution. That same year he was appointed state attorney general, a post he held for ten years. During this period he also briefly served as mayor of Williamsburg. From 1779 to 1782, Randolph was a member of the Continental Congress. In 1786 he was elected governor of Virginia. Randolph was a prominent member of the Constitutional Convention of 1787. A key issue before the convention was the structure and representation of a national legislature. Delegates from small states opposed those from large states. Randolph offered the Virginia Plan on behalf of the large states, which provided for a two-house legislature with representation of each state based on its population or wealth. William Paterson of New Jersey proposed the New Jersey Plan on behalf of the smaller states, which provided for equal representation in Congress. The matter was resolved by the Connecticut Compromise, which created a bicameral legislature with proportional representation in the lower house and equal representation of the states in the upper house. Randolph refused to sign the final draft of the Constitution because he believed that it did not protect the rights of states and individuals. In 1788 he did, however, urge Virginia to ratify the Constitution, proclaiming the need for national unity. From 1789 to 1794, he served as U.S. attorney general for the new national government. Following Thomas Jefferson's resignation as secretary of state, President Washington appointed Randolph to the post. France and Great Britain were at war at the time, and both countries had supporters within the United States. Randolph attempted to carry out Washington's policy of neutrality in the conflict but earned enemies on both sides. Randolph's public career ended in a cloud of scandal in 1795, after the British minister to the United States claimed that Randolph had expressed a willingness to accept money from France to create U.S. policy favorable to that country. Though the charges were eventually shown to be untrue, Randolph resigned. "The prerogative of [a presidential] pardon … is too great a trust. The President himself may be guilty. The traitors may be his own instruments." Randolph returned to Virginia and practiced law for the remainder of his life. In 1807 he served as chief defense counsel for Aaron Burr, who was on trial for Treason. Burr was acquitted after it became clear that the charges were groundless and politically motivated. Randolph died on September 12, 1813, at his estate in Clarke County, Virginia. Conway, Moncure Daniel. 1888. Omitted Chapters of History Disclosed in the Life and Papers of Edmund Randolph. Reprint 1971, New York: Da Capo. Reardon, John J. 1975. 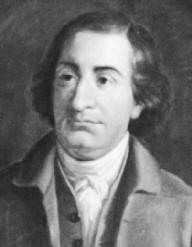 Edmund Randolph: A Biography. New York: Macmillan. Bill of Rights; Constitution of the United States; "The Virginia, or Randolph, Plan" (Appendix, Primary Document).